Wow I really love that bag and your outfits are so cute! I'm getting interested in th Balenciaga bags and I can see they are your favorite. The top is so cute on you. You always style your skirts so well! 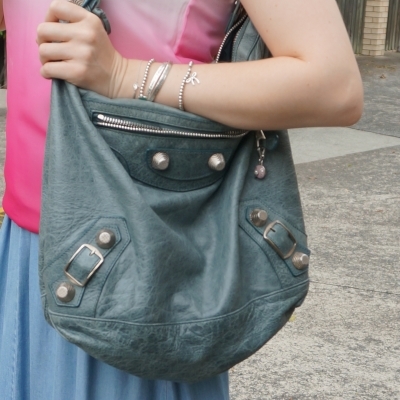 I love the color of that bag, soooo pretty! And goes with everything! That ombre tank is lovely! I really like the look and versatility of maxi skirt but somehow I don't own any. All my skirts are midi length which I just find easier to walk around in. Happy weekend Mica! I'm too short for midi lengths, they just don't look right on me :( I admire them so much on others! I'd gladly send some your way, we have a heatwave at the moment! I'm loving these maxi skirts, Mica! They're very pretty! Love the top outfit, it looks so comfy and perfect for the heat yet still cute and fashionable. Thanks for the advice about the embellished tank top, will try it this summer. I agree maxi skirts are awesome wardrobe staples. I am surprised I don't own one though I just layer over my maxi dresses and it seems to work out for me. Love both outfits! Though they are similar, they are also very different. I love the ombré effect of your 2nd outfit while I love the laid back bohemian vibe of the first. Gorgeous Balenciaga bag too Mica! You're so right about maxis, Mica!! They just seem a little more dressy than shorts. I love both outfits...they are so great with the tanks! Yes still just as practical for running around with the kids, haha! im sure it's pretty warm in there! How cool is this outfit. I love your maxi skirt and embellished tank top. Carrying that oversized handbag is also such a lovely statement. ! Both of these outfits are really pretty! You're right that a maxi skirt never feels over or under dressed. I haven't worn one in years but I think I'll try to add one to my summer wardrobe this year. I hope you have a wonderful weekend and enjoy the warm weather! I think I prefer the first tank, but they are both very pretty and a nice way to look dressy without going overboard. Have a wonderful weekend, Mica! You have some really fun tank tops! I love the ombre one! Big bags are a must with little ones. Sometimes I am carrying so much of their stuff I feel like a pack mule! Haha! haha yes, I can't wait until they are bigger and I have to carry less! I completely agree that maxi skirts are almost magical in their ability to be appropriate for so many occasions. I love how you styled both of these looks. Embellishments really add so much to an outfit. I do agree about maxi skirts, they're a great item to have. I like how you paired your with lovely tank tops. You look lovely! Glad to hear you enjoyed a party at a friend house and hat you managed to avoid the crowds at the shop. Gorgeous outfit! 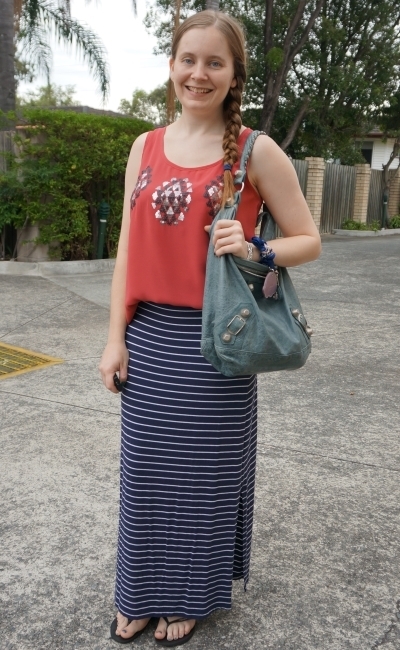 You definitely know how to rock a maxi skirt! Fantastic choice of bag as well... as usual! Your collection of bags is great! hehe thank you, I love my Balenciaga bags! Great looks, I really like how you've styled the skirts! I need to get shopping for a maxi skirt! They are the perfect piece when you don't want to be over or under dressed! You look fabulous in your maxi skirts! I don't look good in maxi skirts, but I love to wear maxi dresses! I totally agree about maxi skirts - they are so easy to style! I really love the second outfit! 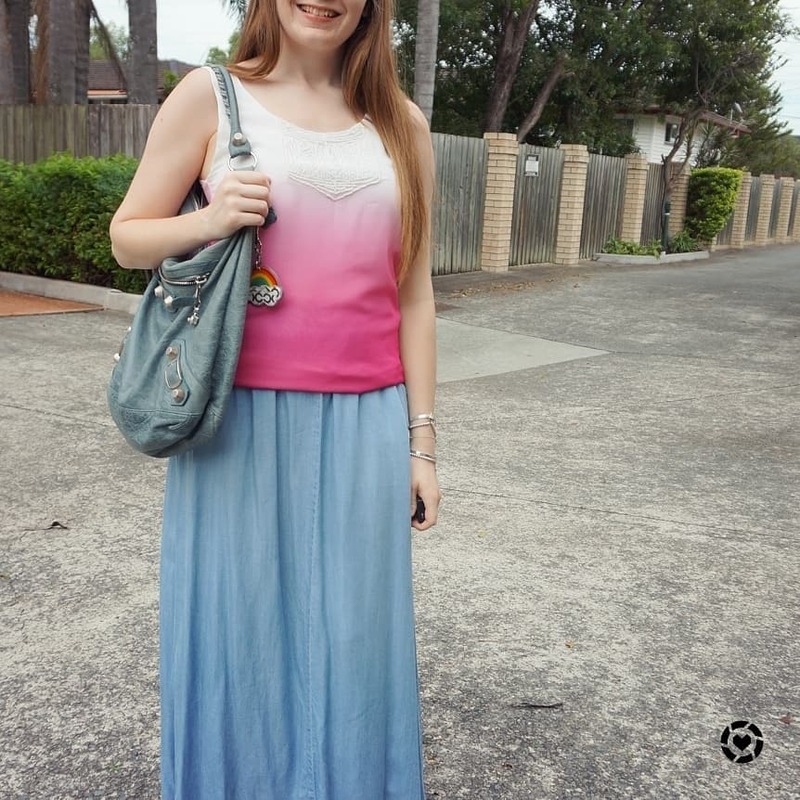 Your pink ombre tank is super cute! I've recently got into maxi skirts myself and I love how versatile they are! As it's winter here I'm tucking jumpers into them but I'm looking forward to warmer weather coming around so I can swap them for strappy tops. Embellishments are a great idea too! Lovely outfits! I wish you a great Sunday! I am in love with your Maxi skirt along with your tank. Such cute colors and your bag is so beautiful 😍. I cannot wait for summer to be able to style my summer clothes :) lucky you . The scarf bracelet is such a cool idea! My eye went straight to it! 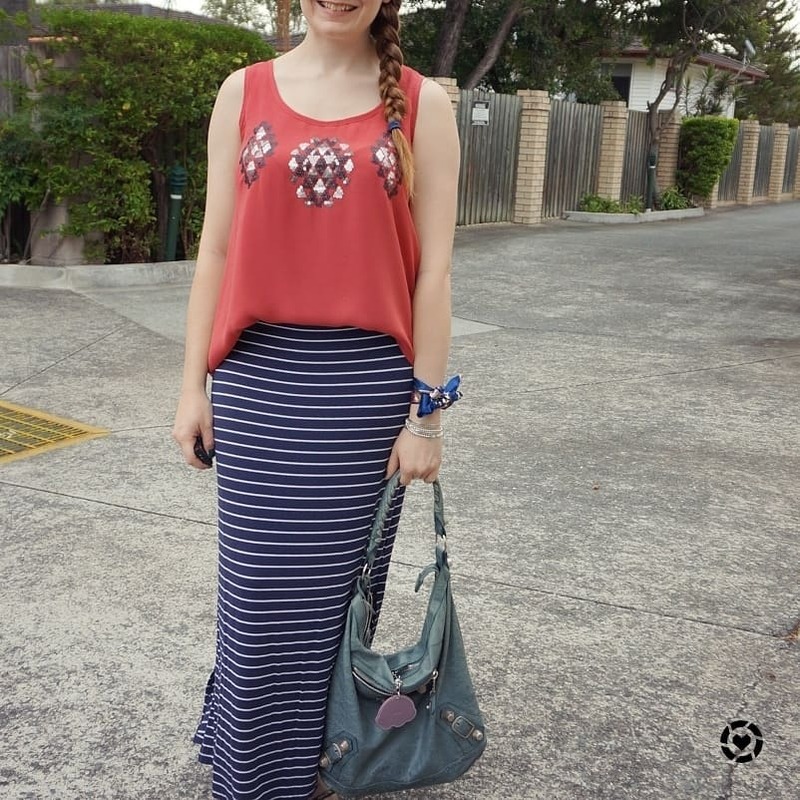 You rock the maxi skirt look! I like that you find so many nice tops to pair them with. They go well with your Balenciaga bag as well. 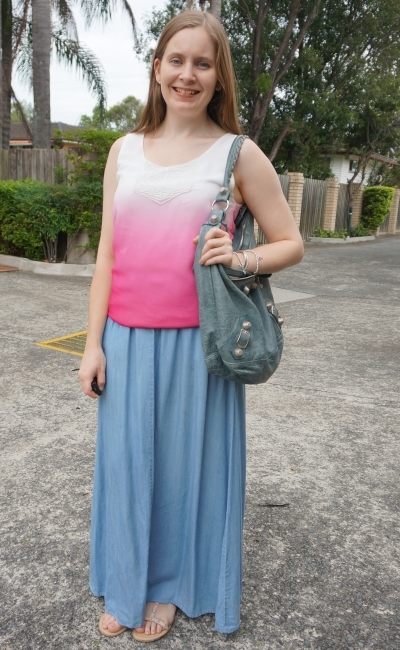 Oooh, I am a big fan of the ombre tank! Keep rocking your outfits! hi dear, would you like to follow each other? Love this combo for summer looks! That striped maxi skirt is my fave piece. They work nicely year round, but mine definitely get worn more in summer too! The tank looks super cute and you look amazing darling. Have a wonderful week a head! I hope you had a lovely weekend, and I wish you a great week ahead. Lovely outfits and beautiful smile! Hope your weekend has been lovely. Have a blessed week ahead. I think sometimes a lot of women forget how versatile maxi skirts really are. I try to take at least one with me when I travel. They are so comfortable. I love the striped skirt/outfit. Enjoy the start to the new week dear! The jersey ones would be great to travel with! :) Crease-free! haha! Love maxi skirts! Yours is so cute! Your the queen at styling maxi skirts. I so need to start wearing mine more. I hope you are have a fab weekend. haha, I do like my maxi skirts! I love wearing embellished tees too, I wear them in the summer with a light blazer to dress up my look. Cute ensemble you have here dear! Love the top, so pretty with the skirt indeed.